This post is beyond hilarious, if you take an iPhone 4S (yeah the one that talks) and ask it “What’s the Best Cell Phone Ever” unsurprisingly the answer you’ll get is “Nokia Lumia 900 4G”. I don’t think there’s much more I can add to that (Siri uses wolfram Alpha for it’s answers- which based the best cell phone on customer satisfaction/reviews). As someone in the source comments section pointed out; this should definitely be part of the Smartphone Beta Test ad campaign; people will see it, think it’s photoshopped, try it on their iPhone and be shocked. 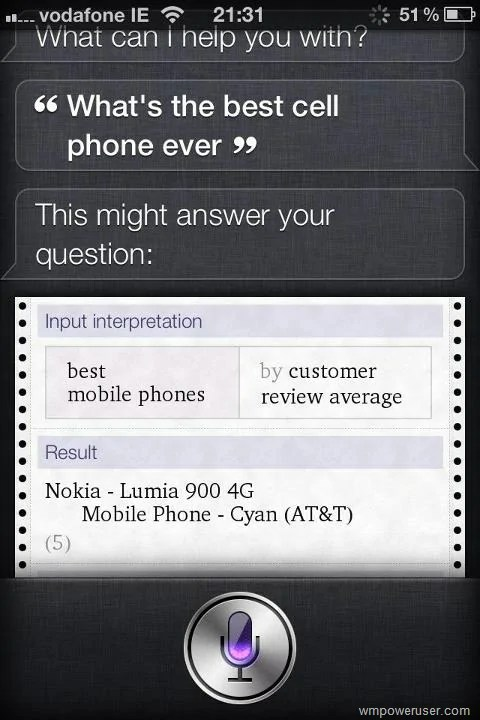 Edit- Just tried this on my brother’s iPhone; not only does it bring up the Lumia 900 as the answer but it also throws in a picture of that beautiful Cyan device. Serious Advertising scheme here- without mentioning the Lumia 900 in an ad simply post “Attention all iPhone users- Ask Siri “what the best cell phone ever is”- “you didn’t hear it from us; you heard it from her”.